Thanks to Debby's book pushing practices my expectations for this book were sky-high*. If I'm being perfectly honest, that was the reason it was a bit of a letdown for me. As soon as I realised I was projecting impossible expectations on this book, I let it go. And I ended up enjoying Penryn's story a whole lot. While I enjoyed the first half of the book, I felt disappointment because I was expecting so much more. So I put it aside for a couple of days so everything could settle and I adjusted my expectations from expecting something mind-blowing to expecting something enjoyable. In the end, I was pleasantly surprised with the outcome. Let me just say that the idea of an angel apocalypse is fascinating to me. I loved this idea. Not another nuclear disaster or war or alien invasion to start the end of the world. No, I really liked this. Angels are supposed to be good and pure and it was nice to see how this was worked into the story. 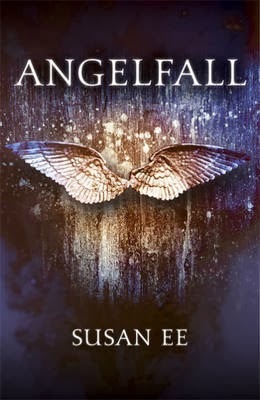 The different personalities in the angels we saw in this book was interesting.. I hope Susan Ee will explore that a bit more in the sequel as well. The last 50 pages or so really made up for the first however chapters I read while I was let down a bit. I loved how action packed it was, how much was happening, and how much the characters were developing. I particularly enjoyed the development of Penryn's hate-relationship with Raffe but then again, I'm a sucker for hate-love-relationships *shrugs*. Having said that, I probably won't have to tell you that I will definitely be reading book two, but I'm going to anyway. I've already ordered it and I'm very curious to find out what's next after THAT ENDING. Now if you'll excuse me, I'm going to post by the mailbox until my copy of World After arrives..
* No hard feelings, Debby ;-) Keep pushing them books! I also love the idea of an Angel apocalypse. I haven't seen that explored in books before. I don't know what it is with this book, but I keep seeing it everywhere! I think it's a sign I must get myself a shiny copy :D I hope I'll get it for Christmas.